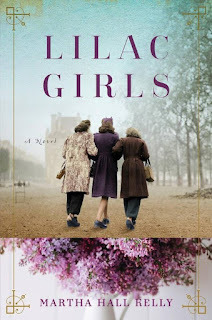 Review: Lilac Girls is a WWII historical fiction novel which follows three women: Caroline Ferriday, a retired actress and NY socialite who does a lot of work for French orphans, Kasia Kuzmerick, a Polish teen working with the resistance movement and Herta Oberheuser, the only female Nazi medical doctor. Kasia eventually finds herself imprisoned at Ravensbruck where she becomes a 'rabbit.' Rabbits were subjected to horrifying surgeries in the name of medical research, while Herta was one of the doctors within the camp. I read another book that incorporated the abject horror of what the rabbits were subjected to and it was no less horrifying here. While I found all of the narratives interesting and the book well written, I felt no emotional connection to any of the characters (there were no tears shed). Upon finishing the book, I read the author's note and was shocked to find out that Caroline Ferriday and Herta Oberheuser were real people. And the character of Kasia was based off of a real rabbit, Nina Ivanska. This lead me to pull up articles on the actual people and read up on them. Overall-this was a well written, interesting and horrifying read yet I lacked a connection to the characters.